Although skin cancer does not receive as much attention as other types of cancer, it is the most common type of cancer in the United States, with more than 2 million people being diagnosed every year. In fact, statistics show that more people are diagnosed with skin cancer than with breast, prostate, lung and colon cancer combined. Since skin cancer is so prevalent, it is important to learn the early warning signs so you can recognize them if you see them. Anyone who has a concern about skin cancer should see a dermatologist for evaluation. The Skin Cancer Foundation recommends that everyone inspect their skin on a monthly basis in order to look for any early warning signs of cancer. The first signs of skin cancer include lesions that have changed in shape or size, a new raised lesion, lesions with raised edges, and lesions that bleed or ooze pus. Common areas for the development of skin cancer include those that are more often exposed to sun, but it can occur anywhere on the body. When inspecting lesions, look for the following characteristics, which should be evaluated by a physician if found. Check for lesions that have an irregular shape, or those that are asymmetrical. A normal mole or other typical skin characteristic will have a more regular shape with even edges. Lesions with uneven or ragged edges are suspect. If you draw a line down the center of the lesion, it should look equal on both sides. 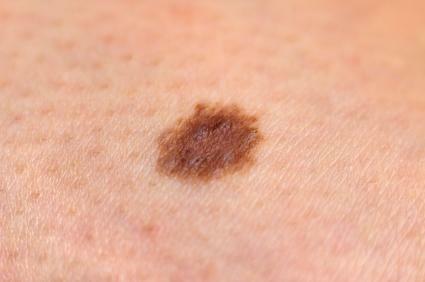 An irregular-shaped lesion could be a sign of melanoma. 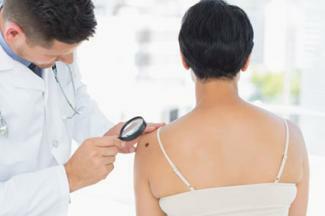 Melanoma is very treatable when found early, but it can be fatal. The occurrence of melanoma has been rising over the last three decades, and while it's most common in people over the age of 80, it can occur in people under the age of 30. The American Cancer Society estimates more than 73,000 cases of melanoma are diagnosed each year, and more than 9,400 deaths will occur from the disease. Other warning signs of melanoma include a lesion that has a diameter larger than one quarter of an inch, is an uneven color, and has an irregular border. Checking your skin every month for changes not only helps find new lesions, it can also help you notice that a lesion that has changed in size. A mole or other lesion that gets larger or smaller should be checked out by a physician. People that are at high risk of developing skin cancer might decide to measure any features on their skin, and record the measurements on a body map in order to track any changes in size. A lesion that grows in size is a characteristic of both melanoma and non-melanoma skin cancer (squamous cell carcinoma or basal cell carcinoma). A lesion that feels raised could be a result of one of several different skin conditions, but this is also a characteristic of skin cancer. Another warning sign on a raised lesion is a shiny, or pearly appearance, which can indicate basal cell carcinoma. Basal cell carcinoma is largely caused by exposure to UV radiation, and it's more common in men than in women. Two groups whose incidence of basal cell carcinoma is increasing are women and people under the age of 40. This type of skin cancer is very treatable when it's caught early, but it can be more troublesome as the tumor grows larger. 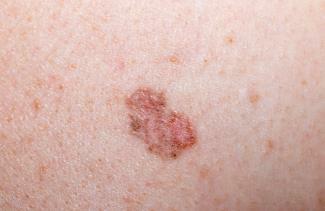 Another warning sign of skin cancer, and specifically of squamous cell carcinoma, is raised edges on a lesion. Only the edges of the lesion are raised, with the center having a sunken-in appearance. Lesions with raised edges may also be accompanied by ulcerations in the center. 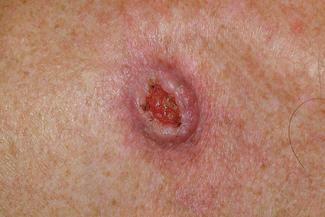 A lesion with raised edges can also be a characteristic of several other skin conditions, including ringworm. Men are twice as likely to develop squamous cell carcinoma as women, and the disease is more common in people over the age of 70. The most common cause of squamous cell carcinoma is exposure to ultraviolet (UV) radiation, and the use of tanning beds increases the risk. 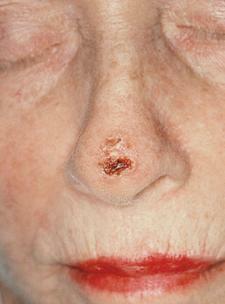 A non-healing lesion the bleeds or oozes pus could also be a sign of skin cancer. It could start as a sore that appeared without any discernible trauma, such as a cut or a burn, that doesn't heal. It may or may not crust over, or it may partially heal, only to start bleeding again. 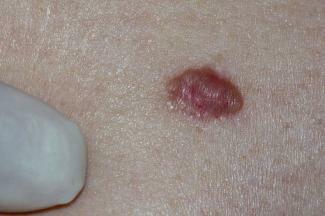 This type of lesion may be a non-melanoma skin cancer. Skin cancer is becoming more prevalent, especially in young women, largely because of the popularity of indoor tanning beds. Another factor, although one that is not as widely accepted for having as profound an effect on skin cancer rates, is the increasing UV radiation that has occurred due to the widening hole in the ozone layer. The most common form of cancer in young people (aged 25 to 29) is now skin cancer. People who use tanning beds are most at risk, although outdoor tanning is also a risk factor for skin cancer. Suspicious lesions or blemishes on the skin should always be evaluated by a physician to determine if they are potentially cancerous and whether they should be excised. Everyone should perform monthly checks of their skin, but people who work outdoors or actively tan (both indoor and out), should be especially vigilant.